Snippets of Jack: "The belligerent homunculus and his friend with the wooden eye." "The belligerent homunculus and his friend with the wooden eye." I am in the mood for a good laugh today. So what better a thing to make you crack up than the silly pirates: Pintel and Ragetti? They switch crews several times throughout the series. In the book, The Price of Freedom, they sail under Barbossa on the Cobra. But once the Cobra is destroyed by the rogue pirates, they remain loyal to Barbossa (not sure why since he's not exactly sympathetic towards them). They must have stuck with Barbossa when he became Jack's first mate on the Black Pearl. Somehow they preferred Barbossa's leadership over Jack's. 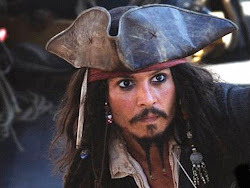 They and the rest of the crew commit mutiny against Captain Jack and leave him stranded on an island. They spend the next ten years doing whatever Barbossa or the other crew members tell them to do. We first see them on the big screen when they are sent on a raid to the governor's palace in Port Royal to search for the medallion. Why such a job like finding the precious Aztec gold would be given to such idiots? I have no idea. If I were captain I would just give them really simple jobs that nobody ever wants to do. Like cleaning stuff. Hopefully even they couldn't screw that up. Anyways, they find what they're looking for" Pintel:The gold calls to us...'Ello poppet." So they bring Elizabeth and her necklace back to the Pearl. The whole crew are amazed that they retrieved not only the last piece of gold, but also what they believe to be the perfect tribute: the daughter of Bootstrap Bill. But of course they had to have messed up somewhere along the way. As it turns out, Elizabeth's last name isn't actually Turner, yet. What an embarrassment. Of course, the silly pirates are the first to be blamed for it. 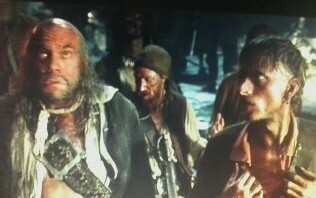 Barbossa: "Gents, you all remember Captain Jack Sparrow? Kill him." Jack: "The girl's blood didn't work, did it?" Barbossa:"Hold your fire! You know whose blood we need? Jack:"I know whose blood you need." Once they've found William Turner, Pintel and Ragetti are in charge of bringing him to the altar. They tell Will that everything will be okay and he won't be slain. And then they change their mind and remind him that he only was minutes left to live. Poor Will! But Pintel and Ragetti don't get to stick around for the show, they are sent out with the rest of the cursed crew to attack the Navy ship. The duo was forced to dress up as women to distract the Navy crew while the other crew members were creeping up the side of the ship. this plan quickly goes awry when a beam of moonlight hits Pintel and Ragetti and their true identities are revealed. And let me tell you it was not a pretty sight! Pintel and Ragetti did eventually get on board the ship and join the fight, but it didn't last long. 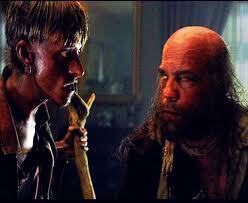 After the great duel between Jack and Barbossa the curse was ended and the crew members were forced to surrender their weapons, but hey at least they can taste apples again!